" The best of the people are those who influence people to do good, prevent them from doing wrong, whose hearts are full of compassion and who fear God." "The (significance of) this world (in comparison) to the Hereafter is similar to one of you dipping his finger in the ocean and then seeing (the amount of water that) has stuck to it. " "By Allah it is not poverty that I fear for you. But I fear that the world will be spread out before you as it was for the people before you.Then you shall compete in it as the people before you competed in it ,and it shall destroy you as it destroyed them." "What do I have to do with this worldly life? I and this worldly life are but like a traveler who stopped for a little while under a tree to get some shade and then he moved on." "The one who shows the beauty of his character and manners in an atmosphere of controversy by staying quiet has won a place at the highest point in <? :namespace prefix = st1 ns = "urn:schemas-microsoft-com:office:smarttags" />Paradise." "Supplicate Allah while you are certain of a response, and know that Allah does not respond to a supplication from a heart that is heedless and inattentive." "This wealth consists of various kinds of treasures and those treasures have keys. 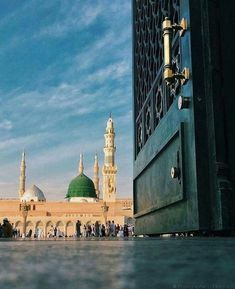 Blessed is the man whom Allah has made a key for good and a lock for evil, but woe to the man whom Allah has made a key for evil and a lock for good." "Verily Allah created Mercy. The day He created it, He made it into one hundred parts. He withheld with Him ninety-nine parts, and sent its one part to all His creatures. Had the non-believer known of all the Mercy which is in the Hands of Allah, he would not lose hope of entering Paradise, and had the believer known of all the punishment which is present with Allah, he would not consider himself safe from the Hell-Fire." "Give people respite from your evil. For to do this is a form of charity that you give to yourself." "A strong believer is better and dearer to Allah than a weak one, and both are good. Adhere to that which is beneficial for you. Keep asking Allah for help and do not refrain from it. (If you are afflicted in any way), do not say: 'If I had taken this or that step, it would have resulted into such and such,' but say only: 'Allah so determined and did as He willed.' The word 'if' opens the gates of satanic thoughts"
" My example and your example is that of a person who lit the fire and insects and moths began to fall in it and he would be making efforts to take them out, and I am going to hold you back from fire, but you are slipping from my hand."